Show Notes: Welcome to another episode of Wildstorm Addiction! Our resident Wildstorm experts Joe David Soliz & Benjamin Murphy review Stormwatch #18, Ravagers #10, and Team 7 #6, as well as some other Wildstorm appearances in the new DCU 52. 00:00:00 – Ben welcomes everyone to episode #45 and gives his spoiler alerts warning. Remember, all written reviews on the website are spoiler free and usually get posted within a day of print release. This month on our “Friends of Wildstorm” series, where we bring on a lifelong or recently converted fans of the Wildstorm Universe we have Jill Johansen a.k.a. Raye from Clark’s Bar. Jill is one of the regular’s at Clark’s Bar and is one who gets some great in depth discussions going on at the boards. She’s also really good at keeping up with posting news and she is an avid Apollo and Midnighter fan. Jill, gives us a quick background on why and when you started following Wildstorm. 00:02:08 – Ben continues with plenty of Wildstorm related news as it pertains to the current books in the DCU. Our podcast is 3 years old! It’s hard to believe it’s been 3 years since we started out at the Comic Addiction and they let us spin off into our own podcast. Thanks to our podcast “fathers” Chris Partin and Michael Smith who still host the Image Addiction podcast. Artist Scott Clark passed away. He came on with the launch of the original Stormwatch in 1993 and was heavily associated with Wildstorm over the years. Most recently we covered his work on the Grifter title. He was only 43. Inker Dave Beaty, who we interviewed a couple of months ago, has come to our Grifter Facebook page and offered to add some behind the scenes material. He recently added a couple of Scott Clark’s sketches for the book. Find the Grifter fan page on Facebook and follow it so you can check it out. Superman: Unbound releases on DVD & Blu-ray on May 7th and it has a preview of the next DC animated movie, Justice League: The Flashpoint Paradox. Grifter had a small role in the comic story Flashpoint so whether or not he’ll get a cameo in the movie remains to be seen. Kurt Busiek’s Astro City returns with a new ongoing series in June. While not a Wildstorm Universe title, Astro City did make its debut under the Wildstorm imprint and had several mini-series afterward. Brett Booth snuck a picture of Backlash on the cover of Nightwing #21, where Booth will become the regular artist. And finally the DC Heroclix: Teen Titans set is out and we have first looks at some of Ravagers and Gen 13 figures in the news section of our site. Be sure to check those out if you haven’t already. 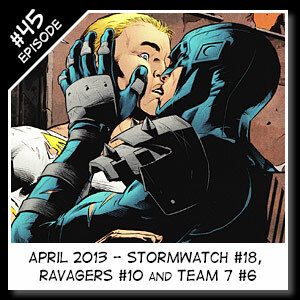 00:08:00 – Our guest and friend of the show, Jill Johansen, starts it off with the review of Stormwatch #18. Released on 3/06, written by Peter Milligan with art by Will Conrad and cover by Ken Lashley and Matt Yackey. 00:22:42 – Joe reviews Ravagers #10. Released on 3/13, written by Michael Alan Nelson with art by Ig Guara and Diogenes Neves, and cover by Ken Lashley. 00:38:15 – Ben gives his review of Team 7 #6. Released on 3/13, written by Jesus Merino and art by Pascal Alixe, Cliff Richards, Gui Balbi & Juan Castro with cover by Gary Frank, Cam Smith, and Brad Anderson. 00:51:55 – Joe gives an update on other Wildstorm related sighting and tie-ins from the other DCU 52 issue #18’s that have released this month. STORMWATCH #19 Team StormWatch is lost in a dimension shift—so what team will rise and take their place? RAVAGERS #11 The latest creature to escape from N.O.W.H.E.R.E. brings death to The Ravagers—but is it animal, vegetable or mineral? TEAM 7 #7 What new member, who threatens to tear the team apart, is welcomed into The New 52? DEATHSTROKE #19 Which teens are the only ones deadly enough to stop Deathstroke? 00:58:42 – Ben gives some quick shout out’s starting with Chris Striker’s The Higher Authority’s message boards Clark’s Bar to continue the Wildstorm integration discussions amongst long time Wildstorm fans at http://theauthority.ws. Also check out our friends of the show, the Image Addiction podcast as they cover new releases from Image Comics and The Savage FINcast as they cover The Savage Dragon. Both can be found at http://www.imageaddiciton.net And get twice the Valiant coverage now with our friends of the show from the Only the Valiant podcast at http://www.onlythevaliant.com and our friends over at www.culturalwormhole.com and their Valiant Future podcast. Joe guest-hosted Ep. 4 last month and will be on the upcoming Ep. 5 as well. 01:01:03 – Ben continues with the contact details as shown below.The opening music is “Universal Domain” by Dreamline which can be found at http://www.musicalley.com. Jill Johansen (Guest Host): www.kentauroi.com where you can check out her artwork and her upcoming webcomic. Post your comments for each episode on the wildstormaddiction.com! Our show is now on Stitcher! Listen to us on your iPhone, Android Phone, Kindle Fire and other devices with Stitcher. Stitcher is Smart Radio for Your phone or tablet. Find it in your app store or at stitcher.com The latest episode is always available for you- no syncing needed… and no memory or storage wasted! Stitcher SmartRadio- The Smarter Way to listen to radio. Joe will be at Pax East in Boston, Massachusetts March 22-24 helping to promote his friend’s upcoming video game Mech Knight Chronicles which is frm Dinosaur Games. They can be found at www.dinosaurentertainment.com. This entry was posted in DCU, Podcast, Ravagers, Stormwatch, Team 7 and tagged Brad Anderson, Cam Smith, Cliff Richards, Diogenes Neves, Gary Frank, Gui Balbi, Ig Guara, Jesus Merino, Juan Castro, Justin Jordan, Ken Lashley, Matt Yackey, michael alan nelson, Nathan Erying, Nei Ruffino, Pascal Alixe, Peter Milligan, podcast, ravagers, stormwatch, Team 7, will conrad. Bookmark the permalink.